Find your ultimate comfort. With the dual-zone temperature, both you and your front passenger can set different temperatures within several degrees. This allows every passenger to feel comfortable, while the integrated cabin air filter allows every breath to be as fresh as the next. To easily recall your comfort settings, just press the memory button or unlock the door with your corresponding key fob. Your settings for pedals, mirrors, seats and even the radio presets are recalled almost instantly, so you never have to hassle with trying to find your comfort level. Chrysler 300's available steering wheel audio controls let you change stations, adjust volume and more without ever taking your hands off the wheel. The ultimate in convenience, Chrysler 300's Passive Entry System with push-button start recognizes that your key fob is in your hand, your pocket, or anywhere else on you. Then it unlocks the doors and lets you start the car by just touching a button, without ever placing the key into the ignition. The available rain-sensing windshield wiper system utilizes an infrared sensor that automatically activates the wipers when it senses moisture. Allowing a gentle breeze to ripple through your hair, the Chrysler 300 offers an available power sunroof. Vent it or open it wide, and enjoy all that nature has to offer. Helping you keep pace is the Chrysler 300C's available Adaptive Cruise Control. This vehicle's system uses Light Detection and Ranging (LIDAR) to monitor traffic flow up to 328 feet in front of the vehicle and adjusts speed accordingly — even alerting you to stop if needed. 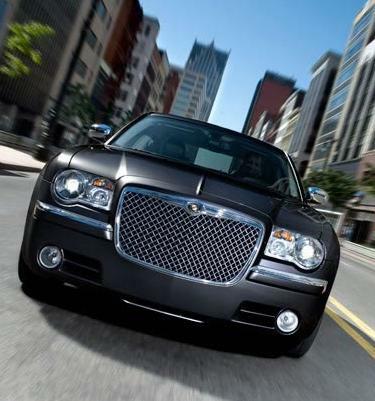 The Chrysler 300 reacts before you do with available SmartBeam™ intelligent headlamps. The headlamps automatically dim when sensing a vehicle within 2,000 feet, making sure you never have to do a thing. Think of it as command central. Advanced Uconnect™ Media Center radios let you store thousands of songs, select playlists, play videos, view photos and more. Properly equipped models let you listen to SIRIUS Satellite Radio and navigate. And if equipped with Uconnect™ Phone, the radio accepts voice commands. The available voice-activated phone lets you communicate virtually hands-free with an in-vehicle, voice command system that allows you to talk using your Bluetooth®-compatible phone.